Things are small in Japan. This packet contains four handy tubes for maybe four weekends of travel (or "trabel"). Xylitol is a natural sweetener with fewer calories than sugar. (But then, who would want a toothpaste with sugar?!) Wikipedia says, "As with most sugar alcohols, initial consumption can result in bloating, diarrhea, and flatulence" ... a bit scary. As you know, most toothpastes aren't meant to be consumed - just spit out after use. So those problems might not affect you. 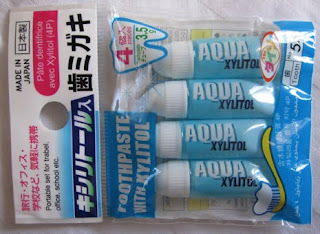 Aqua Xylitol is a basic blue gel paste. Very mild (forgettable) flavor. A special thanks to Jason and Seana, who kindly brought me the packet from their recent trip to Japan. Friends are great!